The London and:guide gives tourists and professionals an overview of the newest costruction s in the pulsing city. The extraordinary architecture and interior design of 84 buildings is presented in this book. Among them, the City Hall, Tate Modern and the Millennium Bridge as well as the newest hotels, restaurants, and showrooms are described and illustrated with color photographs. 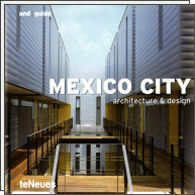 This guide offers an extensive trip to 72 of the most recent constructions in the pulsanting Mexico City. Compiling outstanding architectural and interior design projects from Teodoro Conzaàles de Leon (Museo de Arte Popular), Tailer de Arquitectura X/Alberto Kalach (Biblioteca Vasconcelos), TEN Arquitectos/Enrique Norten (Chopo Museum), as well as the newest hotels, restaurants, shops, and public projects. Informative texts, addresses and a map are included. For a decade, Moscow has enjoyed an enormous building boom that is creating architecture just as bright and diverse as the metropolis itself - from minimalism to color-happy post-modernism, from deconstructivism to neo-classicism - everything is an offer. This and guide features highlights of Moscow's architecture and design and introduces the best restaurants, shops and hotels. The guide includes a city map, addresses and Internet sites.